No Hidden Fees or Charges! 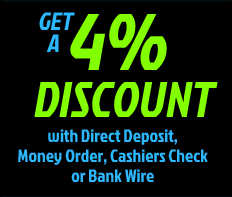 Easy Layaway Plan Available! 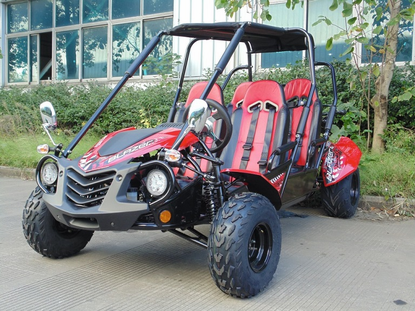 We are very proud to introduce another new TrailMaster go kart: The Blazer4 150X! FREE HELMET WITH PURCHASE! A $149_Value FREE!! 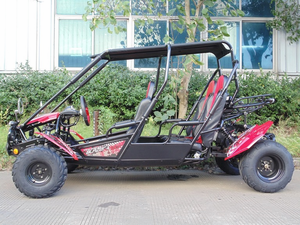 This is a full size 4-seat go kart fits up to 4 adults! Front seat to rear seat distance is 26 inches that fits passengers up to 6�? ?2 in height! It is made of heavy duty frame, net weights 578 lbs with a max load capacity of 800 lbs! With bigger front / rear tires of 20 x 7-8 / 21 x 10-10 and special gear ratio set up, plenty of power to take off and pull 4 people. FREE SHIPPING! FREE HELMET with Purchase!! A $149_value! PLUS ALL THESE FEATURES TOO! The NEW TrailMaster Blazer 150 is an adult size kart and the latest in our all new Blazer series offerings. Loaded with all the most requested features, stunning new styling and exciting graphics, this model is sure to be a head turner wherever you ride. Great looks, outstanding performance, extremely competitive pricing and world class support...it doesn't get any better than that! Multi-Unit Discounts = Buy 2 Save $75 / Buy 3 Save $150 / Buy 4 Save $225!! Simply Enter One of the Coupon Codes Shown Below At Checkout! Configurations And Specifications Subject To Change Without Notice. Your satisfaction is our #1 goal. We strive to provide our customers with the highest level of customer service and support we can. We strongly suggest our customers read the following information thoroughly. If you have any questions about any of our or the manufacturers policies, please feel free to email us or call 1-877-667-6289. If you need parts at the bottom of our home page you will find �Parts Request� or http://www.motobuys.com/part-request-form.html = simply fill out the form and click submit. OFF ROAD: ATV'S, UTV'S, BUGGIES, GO CARTS AND DIRT BIKES offer 3 MONTHS PARTS, 6 MONTHS ENGINE WARRANTY, MOTOBUYS.com will supply new or rebuilt replacement parts in exchange for defective parts for a period of 3(three) months, as well defective engines for a period of 6(six) months from the date of purchase at no charge. Buyers will need basic repair & basic setup skills such as using tools; replacing nuts & bolts, filters, light bulbs, fluids, adjustments, etc. If you don�t have this ability we suggest using a mechanic to assist you with your needs. Our tech support Hotline is available to assist you. FUEL SYSTEM: For carburated vehicles; Carburetor, vacuum fuel pump, intake manifold, fuel tank and fuel petcock. For fuel injected vehicles; Fuel injectors, fuel pump, fuel rail and fuel pressure regulator. ELECTRICAL: Stator, stator pickup, magneto, voltage regulator\ rectifier, CDI, starter relay\ starter solenoid, starter motor, coil, distributor assembly and injector relay. COOLING SYSTEM: Radiator, radiator cap, thermostat, thermostat housing, temperature indicator switch, cooling fan motors; water pump and water pump housing. BRAKES: Calipers, drum housings, drum brake linkage, reservoirs, rotors, and lines. WHAT IS NOT COVERED: The following is a list of items not covered by the warranty policy. This list is not all inclusive and may be modified at any time. Batteries, Belts, Brakes and Brake Pads, Chains, Clutch, Foot peg mount, Hand Levers, Hoses, Lights, Mirrors, Plastic Body, Seats, Shocks, Spark Plugs, Tires, Transmission. Improper adjustment\operation of brakes. Driving with parking brake on. The following items are not covered: Tires, rims, body panels, fuses, forks, shocks, gaskets, light bulbs, seats, CV Boots, oil filter, air filter, fuel filter, filters, clutch wear parts, cables, drive belt, chain, spark plug, any part made from rubber, belts, brake linings and/or pads, batteries, sprockets, external springs, clips, nuts, bolts and fasteners. HANDLING OF WARRANTY CLAIMS: FOR PARTS: All Parts warranty issues must be processed through http://www.motobuys.com/part-request-form.html or if directed by the manufacturer. You must produce a copy of your original invoice showing the model number, vehicle identification number and date of purchase on the invoice, as well as a copy of your Consumer Motor Vehicle Delivery Preparation and Inspection Form to warranty your product directly. All defective parts must be returned to MOTOBUYS.com or the manufacturer as directed for inspection and verification of defect. MOTOBUYS.com reserves the right to decline any warranty claim based on the criteria listed in the COVERAGE AND LIMITATIONS portion of this warranty. FOR ENGINES: All Engine warranty issues must be processed through MOTOBUYS.com or if directed through the manufacturer of the unit purchased. In ether case, after obtaining an RMA number from MOTOBUYS.com, you will be provided with a return shipping label. The motor must be removed from the vehicle, safely packaged and shipped to our repair facility located at the address listed on the shipping label. MOTOBUYS.com or the manufacturer reserves the right to decline any warranty claim based on the criteria listed in the COVERAGE AND LIMITATIONS portion of this warranty.